At Rehab 4 Alcoholism, we admit thousands of individuals into alcohol rehab centres each and every year. Because of this, we often get asked whether alcoholism is linked to depression. To address this question appropriately, we have decided to dedicate an entire article to this important subject. Experts now refer to alcoholism as alcohol use disorder or AUD. This is because problems people experience with alcohol should not be limited to cases that are considered a 'dependency'. AUD includes alcohol dependency, alcohol 'alcohol abuse' and 'heavy alcohol consumption' where a dependency has not arisen. To suffer from AUD, the user must meet the criteria set out in the Diagnostic and Statistical Manual of Mental Disorders (DSM), under DSM–5. To assess whether you or a loved one may have an AUD, ask some of the below qestions. When you consume an excessive amount of alcohol, the chemical constitution of your brain is altered. This is because alcohol depresses ‘neurotransmitters’ located in the brain. Neurotransmitters aid the transfer of signals between one nerve cell to another. This means you feel relaxed and less inhibited when you drink alcohol. 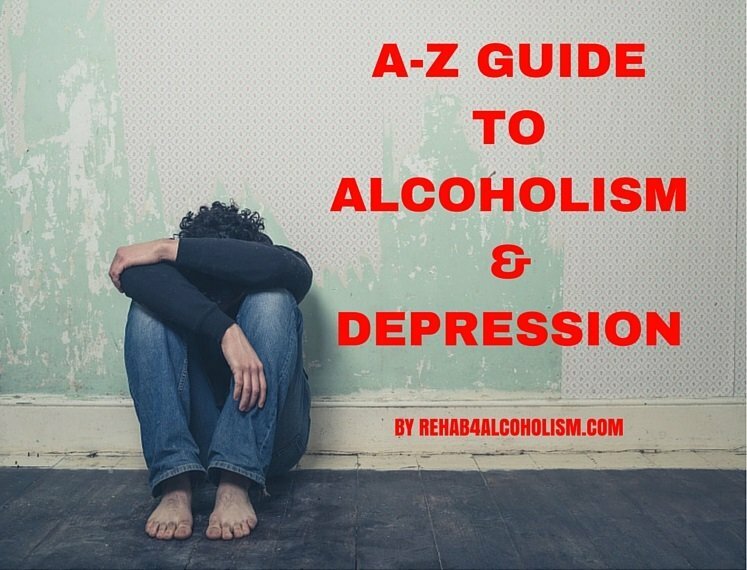 However, if you develop alcohol use disorder you will begin to experience a number of negative emotions such as depression, anxiety and anger. This is because alcoholism interferes with inhibitory neurotransmitters known as GABA-A. GABA-A is required for healthy mental health. Alcohol increases GABA-A. Because GABA-A is an inhibitory neurotransmitters, increasing its activity will slow nerve cells ability to transmit message across the brain. A difficult conundrum for addiction experts is determining whether alcoholism is the cause of depression or whether alcoholism is a symptom of depression. In determining this important question, rehab centres typically carry out a comprehensive psychological assessment upon admission into their care. However, research conducted by the National Institute on Alcohol Abuse and Alcoholism claims that for the vast majority of people, alcoholism is a symptom of an underlying mental condition and not the cause. The majority of people suffering from alcoholism started to suffer from depression from an early age, typically during childhood. This depression is usually triggered by a traumatic event such as abusive parents, divorced parents or sexual abuse. Upon entering early adulthood, many of these traumatised young adults turn to drugs and alcohol as a 'release' from their worries. Adults who did not suffer a traumatic childhood are far less likely to develop alcoholism. The retired footballer, Paul Gascoigne is a prominent example of somebody who suffered alcoholism due to trauma suffered in childhood. Gascoigne lived with his family in a single upstairs council house bedroom in Newcastle-Upon-Tyne. When Gascoigne was ten years old, he witnessed the death of a friend in a vehicle accident. Gascoigne claims these early experiences contributed to the development of his alcoholism in later life. However, traumatic events suffered during adulthood can also trigger alcoholism and drug use, particularly when these events trigger clinical depression. Traumatic events that lead to depression and addiction in adulthood include financial problems, the breakup of a relationship and workplace bullying. Turning to booze in order to 'self-medicate' one's depression is commonly referred to as 'drowning one's sorrows." For instance, The Temptations lead singer, Paul Williams, suffered alcoholism and committed suicide in the early 1970s despite reporting a healthy and happy childhood. Paul turned to alcoholism as an escape from his creative and financial problems. However, traumatic events suffered during adulthood are often a continuation of earlier traumatic events suffered during childhood. Traumatic events in the past thus increase the probability of new traumatic events occurring during adulthood. It is almost as if the sufferer is trapped in a maze of traumatic events. Alcohol and drug use are often seen as the sufferer's 'way out'. One study conducted at Harvard University in America involved interviewing 15,000 twice over a one year period. After one year had lapsed those who reported signs of depression during the first interview were much more likely to have suffered from alcoholism over the next twelve months compared to interviewees who did not report any symptoms of depression. However, the study also revealed those who suffered from alcoholism were more likely to suffer from depression over the course of the year. In both scenarios, women were at a greater risk than men of developing both depression and alcoholism. But can alcoholism cause depression? The answer to the above question is a resounding yes, at least according to numerous studies that examine the neurotoxic effects that alcohol exposure has on the brain. This is known as 'alcohol induced depression'. Let's not forget that alcohol consumption makes you more likely to commit acts that they will later regret. In turn, these acts may lead to depression. Excessive alcohol drinking could lead to poor professional, social or financial decisions that in turn lead to your depression. 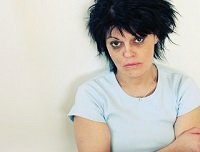 Although there exists no absolute causal link between depression and alcoholism, study after study seems to show those who suffer from alcoholism are much more likely to suffer from depression when compared to people who do not suffer from alcoholism. This is particularly the case for people who suffer from long-term alcoholism. Studies confirm you are twice as likely to suffer from a depressive disorder if you suffer from alcoholism. At Rehab 4 Alcoholism, we've found around 40% of alcoholics we treat have major depression. 50% have significant anxiety symptoms and 15% suffer from manic or elation symptom. After 4 weeks of sobriety, the incidence of depression reduces by around 10%, and anxiety reduces by around 15%. Clearly, a number of weeks of abstinence has the potential to reduce depression. People suffering from depression may 'self-medicate' with alcohol in order to numb the pain caused by depression. 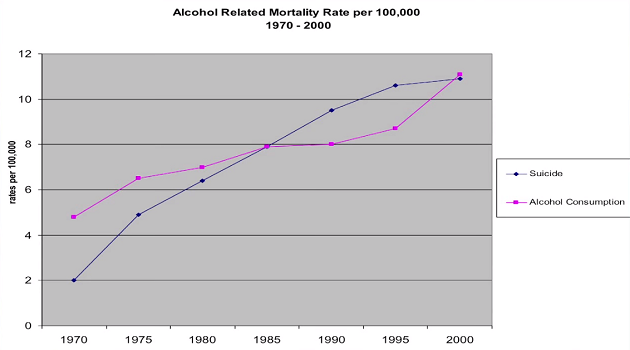 This is because alcohol is a central nervous system depressant. Over time, many of these people begin to develop an addiction to alcohol. This is particularly the case for female sufferers of depression, for reasons that are largely unknown. When alcoholism is coupled with clinical depression, this is known as 'dual diagnosis'. Teens who experience clinical depression are twice as likely to suffer from alcoholism than teens who do not suffer from depression. Women are around twice as likely to suffer from alcoholism if they have suffered from clinical depression. Unfortunately, self-medicating with alcohol in order to treat depression is highly ineffective. In fact, alcohol consumption is known to exacerbate the symptoms of depression, and even cause over related mental health problems such as anxiety. Alcoholism and alcohol abuse are also linked to suicide. Worryingly, when people are intoxicated they are much less inhibited when it comes to playing out suicidal ideas. 25% of suicides are solely attributable to alcohol. An Irish study revealed alcohol is present in around 58% of completed suicides. The same study revealed 93% of people under the age of 30 had alcohol in their blood when they committed suicide. Although the link between alcoholism and depression are clearly apparent, there does exist other factors affecting the development of depression. Alcoholism is a physical addiction that will aggravate your addiction. After all, alcohol is a depressant. It thus makes sense to detox from alcohol before you attempt to treat the underlying depression. Once you detox from alcohol, your depression should begin to decrease. This will make you feel happier. If your depression totally disappears, you can conclude your depression was probably caused by your drinking. Now that you are detoxed from alcohol, you must re-assess your depression. If your depression continues despite quitting alcohol, you may be able to conclude your alcoholism was a symptom of your depression. In such a scenario, it's important to see a therapist in order to treat your underlying depression. If you take no action, you risk relapsing since the conditions are still apt for your alcoholism to reappear. Therapies we recommend for depression include cognitive behavioural therapy (CBT), interpersonal therapy and psychotherapy. Residential treatment means you live within a rehab centre whilst you undergo a detox and therapy sessions. This means you are removed from your environment were you drink alcohol. This makes your detox easier since alcohol is not available to you whilst you experience withdrawal symptoms. Once your detox is completed (around 6 days into your rehab), you will then engage in intense sessions of CBT and psychotherapy that seek to treat your underlying depression. This is often advantageous to outpatient treatment because you receive lots of therapy in a short space of time. This may mean you get more out of your therapy sessions compared to spreading sessions over a long period of time on an outpatient basis. We must stress that taking medications should be seen as a measure of last resort. However, if you are not able to eliminate your depression using more natural alternatives, you may consider taking anti-depressants. To reduce your drinking, you may also consider taking disulfiram (Antabuse) and acamprosate (Campral). Click here to learn more about these medications. Research confirms the effectiveness of exercise when it comes to the treatment of mood disorders such as depression. Robust cardiovascular exercises such as jogging, running and cycling are particularly effective when it comes to treating milder forms of depression. Relaxation techniques are known to effectively treat depression. Relaxation techniques we recommend include yoga, mindfulness and tai chi. These methods help you attain a state of deep relaxation. ECT (Electroconvulsive Therapy) involves sending electric currents through the brain. These currents then trigger an epileptic seizure. This seizure is known to reduce symptoms associated with mood disorders. When you undertake ECT, you must receive a general anaesthetic and other muscle relaxants. This prevents a convulsion during the seizure. ECT is typically reserved for people suffering from life-threatening depression, and when the person has not responded to less invasive forms of mood disorder treatments. ECT is also used to treat severe postnatal depression or where a person suffers from manic or psychotic episodes. Tim is an avid blogger. 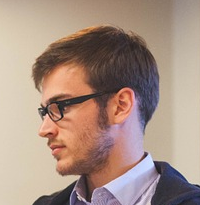 Tim writes about a variety of topics including healthcare, science and literature.